Nowadays, instant messaging (IM) has become one of the main applications of mobile phones, with plenty of “apps” available and literally billions of messages exchanged every day. With the widespread diffusion of mobile Internet traffic plans, IM applications are rapidly replacing other forms of mobile communication, such as text messages and, in some situations, even e-mails. As conversations are rapidly converging to IM applications, it is natural to start asking how secure this communication channel actually is, and if users can really trust IM apps and their back-end infrastructure. We decided to pick one of these applications and look “under the hood”, in order to see how the developers tried to ensure the confidentiality of in-transit communications. After a quick survey of available IM applications, we decided to start with WeChat, a popular mobile IM platform developed by the China-based Tencent company. The choice of this specific application was quite arbitrary and mainly based on the fact that, in this period, WeChat is publicized a lot on the Italian TV. WeChat is a feature-rich and sophisticated mobile application, which allows users to communicate via text messages, voice calls, to share photos and videos, and much more. The app is available for several mobile platforms, but we focused on the Android version only: according to Google Play, WeChat for Android alone has more than 50 million downloads. 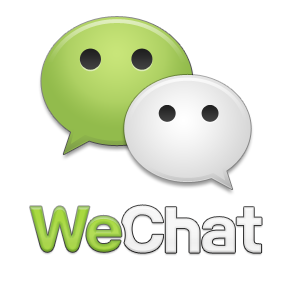 Most of the issues discussed in this post should affect Android versions of WeChat up to 4.5.1. On August 5th, 2013, Tencent released version 5.0, which introduced some major changes; we still have to analyze this version in detail. The most obvious and easy thing to start with was an analysis of the network traffic generated by the application during normal usage. At this aim, we instructed our Android emulator to save all network traffic to file, we installed WeChat, we logged in and sent a couple of text messages. Part of the traffic generated by WeChat is shown below. As can be seen from the figure, most of the traffic travels on TCP port 8080, typically reserved for HTTP connections (previous versions of WeChat were using the standard HTTPS port, tcp/443). 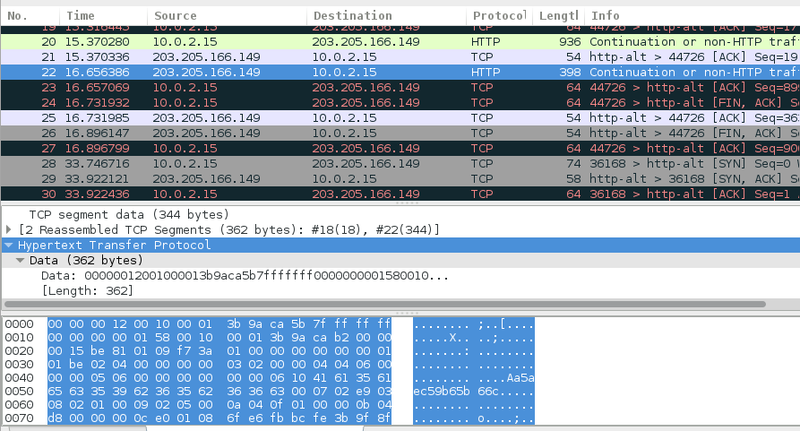 However, at a first sight, the payload of these packets looks quite strange; indeed, Wireshark is not even able to dissect the HTTP payload. This initial header is followed by an opcode-dependent message body, usually in encrypted form. Briefly, the first message is encrypted by the application using RSA, with an hard-coded public key; next messages are encrypted in AES. In WeChat versions up to 4.3.5 we identified several vulnerabilities which allow an attacker who can intercept the traffic to quickly decrypt the message body, thus being able to access the messages sent and received by the user. More recent versions seems to be immune to these attacks, but we still have to perform a more in-depth analysis of the encryption scheme implemented in the latest WeChat releases. Here we come to the interesting part 🙂 WeChat includes an undocumented debugging infrastructure, probably used by developers for testing purposes. However, this infrastructure can also be abused by attackers to steal sensitive information concerning a WeChat user account. In detail, WeChat reads debug settings from an Android ContentProvider, identified by URI “com.tencent.mm.coolassist.debugprovider/config”. This ContentProvider is used by the application as a centralized source of debug configuration parameters, and can be employed to specify which debug messages should be logged to the Android console (adb logcat), to save log messages to the sdcard, and even configure a remote logger. From a security perspective, the remote logging feature is surely the most interesting one. By exploiting this functionality, an attacker can develop a malicious application which exposes the aforementioned ContentProvider and, through specially-crafted debug settings, makes WeChat to send logs to an external, attacker-controlled, server. Such a malicious application would not require any special Android permission. The next section details the communication protocol used by WeChat to interact with the remote log server. The first key defines the log level (“0” simply means to log everything), while others are used to set the log server address for the two main WeChat application modules (mm and push). WeChat developers implemented a trivial key derivation scheme to allow the application and the remote log server to agree on an encryption key to cipher debug logs. In a nutshell, the app reads three ASCII lines from the server and uses these lines to derive a DES key. Before transmitting debug messages, the application encrypts them in DES/ECB using this key. The key generation function is implemented by the following Python code snippet. Function generatekey() receives in input the three lines sent by the server and returns the corresponding DES key. We also implemented a buggy “quick & dirty” Python script that listens for incoming connections, sends out three ASCII lines, computes the key and deciphers incoming messages. The script is available here. As a final note, we would like to point out that the “.com.tencent.mm.debug.log.mmlog.url. * ” configuration keys are not supported by the latest version of WeChat (5.0). However, this version still queries the ContentProvider for debug settings and part of the logging functionalities have been moved to a dedicated JNI library. We plan to investigate these new features in the future, so at the moment we cannot exclude that the remote logging mechanism has simply been moved elsewhere. WeChat locally stores application data in an encrypted SQLite database named “EnMicroMsg.db”. This database is located in the “MicroMsg” subfolder inside the application’s data directory (typically something like “/data/data/com.tencent.mm”). Here deviceid is the value returned by the Android API function TelephonyManager.getDeviceId(). Follows a sample SQLCipher console session that demonstrate how the EnMicroMsg.db database can be decrypted. It is also worth pointing out that, as the key generation algorithm truncates the password to 7 hex characters, it would be not so difficult for motivated attackers who are able to get the encrypted database to brute force the key, even without knowing the uin or the device identifier. In this post we discussed some security weaknesses that affect Android versions of WeChat up to 4.5.1 (and possibly others). We tried to contact developers to notify our findings, but with no luck: we wrote an e-mail to Tencent technical support both on August 30th and on September 3th, but we got no reply. With the recent widespread diffusion of mobile instant messaging, app developers should take security into more serious considerations, as their application will probably rapidly become an attractive target for attackers.